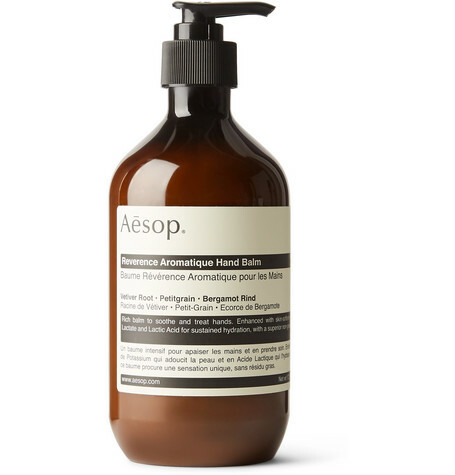 Aesop ‘s ‘Reverence Aromatique’ balm is a rich treatment for tired hands. Infused with a blend of fragrant botanicals including Vetiver Root, Petitgrain Extract and Bergamot Rind, it has an earthy aroma and non-greasy feel. Use it as often as you like to soften rough skin or relax. – Concentrated hand cream – Massage into clean hands and cuticles as desired – Use it after the Reverence Aromatique Hand Wash – – 500ml/ 17.6fl.oz. Ingredients: Water (Aqua), Glycerin, Prunus Amygdalus Dulcis (Sweet Almond) Oil, Stearic Acid, Cetearyl Alcohol, Ceteareth-20, Cocos Nucifera (Coconut) Oil, Macadamia Ternifolia Seed Oil, Citrus Aurantium Bergamia (Bergamot) Fruit Oil, Glyceryl Stearate, PEG-100 Stearate, Phenoxyethanol, Tocopherol, Butyrospermum Parkii (Shea Butter), Theobroma Cacao (Cocoa) Seed Butter, Potassium Lactate, Citrus Aurantium Amara (Bitter Orange) Oil, Vetiveria, Zizanoides Root Oil, Triticum Vulgare (Wheat) Germ Oil, Glycine Soja (Soybean) Oil, Lactic Acid, Citrus Grandis (Grapefruit) Peel Oil, Fusanus Spicatus Wood Oil, Disodium EDTA, Benzoic Acid, Dehydroacetic Acid, Ethylhexylglycerin, Aloe Barbadensis Leaf Juice, Daucus Carota Sativa (Carrot) Root Extract, Beta-Carotene, d-Limonene, Linalool, Farnesol, Citral- For Men.